As soon you start meditating, reciting Nam, and seeking God’s Light within yourself, your life will change. As more and more people do so, the world will change. Baba Virsa Singh ji is a holy person of Biblical proportions whose powerful spirituality was first recognized when he was a child. Born on 20 February 934 in the rural village of Raja Jung outside of Lahore, he was uprooted in 1947 by Partition and moved with his family to Sarawan Bodla, a mud-brick village in Punjab, India. He spent his days plowing and working on the family farm, until one day in his late teens he experienced great anguish while cutting fodder for the animals. As the sap poured out, Babaji was consumed with the feeling that he had committed a great sin and prayed to be released from that duty. At once, sores appeared on the soles of his feet, so painful that he could not work. From that time, he began meditating day and night under the Beri tree in the courtyard, calling out to the One whose presence he could feel to “Please come – please show yourself.” Babaji became so thin that his father took him to a local doctor. He still laughs when he remembers that time, as the doctor could not find anything wrong with him. After that, Baba Siri Chand ji and Guru Gobind Singh ji were constantly with him, instructing the young man in strict meditation and in service to humanity. It was then that Baba Virsa Singh was shown that he would have to work very hard, that his fame and wealth would spread, that he would develop great farms, and perhaps most strange, that he would have a great following in Russia. When the boy began healing intractable diseases by giving people leaves from the Beri tree where he sat – or when the leaves were gone, simply by dipping his fingers in water – bringing the dead back to life, and transforming people’s lives, villagers recognized that great spiritual powers were developing within him. They began to gather around him, and all have stories of the miracles that happened daily among his followers. poor in spirit, prayers are offered round the clock. To uplift the deserving poor, langars (free community meals where people of all castes sit side by side on the ground), free medical care, schooling for children, are offered free of cost. And to teach reverence for all those who bring God’ message and their teachings, Babaji holds interfaith gatherings and celebrates the major holidays of all religions. The love of God is a basic theme running through all of Babaji’s teachings. When he is not in secluded meditation, he gives informal, spontaneous discourses. 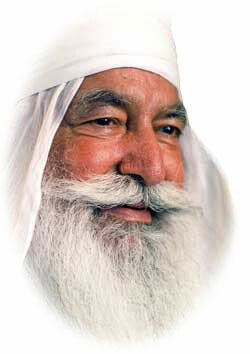 He speaks in sweet and simple village Punjabi, mixed with esoteric spiritual terms from many languages and religions, charged with profound spiritual meaning. These discourses have inspired and transformed the lives of countless people and have produced practical demonstrations of God’s power to change the world. We have gathered the essence of these teachings from many discourses and offer them to you topic by topic that you too may grow in your love for God. All religions are one. All the Prophets and Messiahs have repeatedly said that there is One God, whom we must love. No Prophet has said that there are two Truths or two Gods. There is One God, and we are to see Him in every planet and person, in animals, oceans, mountains. But we will only be able to see God in all of His Creation when the love of God emerges within us. God is the Power that runs everything. When saints or Prophets have seen or heard this Power through gyan, the divine wisdom of enlightenment, they then spoke of that Power in words that became the Divine Names for God. All are referring to the same One. One enlightened person saw that there is One Power giving light to everyone. He said, “Ik Onkar” (You are One). Another saw that Power controlling all the waters-waves, rivers, oceans of water. He called that Controller “Narayan” (the One who is present in water). Another person saw that One Light is giving life to everything. When he looked within himself, he found the same light there. He said, “Sohang” which means “Whatever You are, so too am I.” Another person saw that God’s Light is everywhere: “You are in Darkness as well as in Light.” He referred to this Power as “Gobind” (Remover of darkness and Bringer of light). Another person who saw this Power found it so wondrous that he had no words for it. All he could say was “Wah!”(Wonderful!). Still another saw that Power is infinite, beyond description. He said, “Neti, neti, neti” (beyond, beyond, beyond). Such descriptions from an enlightened state are not contradictory. They are all describing the same Power, whether in Sanskrit, Arabic, Punjabi, Urdu, Latin or English. There are differences in the words, but not in the Being. God is one Light. It comes in the person who meditates and who is filled with love. Only this person can perceive the Power. First look within yourself, and then you will see God everywhere. God has been here from the beginning; God will go on forever. But from time to time, the number of people who have pure minds full of faith in and love for God decreases. The people have forgotten; their minds have become impure and they do not listen to a Power they cannot see. Then God, who is both manifest and un-manifest, has to come in the physical form of a Prophet. For people will only follow someone whom they can see and hear. With God’s blessings, God’s grace, and God’s mercy, this person begins to realize God, and God’s Power and Light start working through his tongue and heart. God chooses Prophets but does not reveal anything to them in the beginning. When the right time comes, God gives them gyan. God then discloses certain things to them at certain times, but still keeps many things secret. After God begins using a person as His Messenger, that person no longer works from his own mind or his own heart. It is all God’s work. All the Prophets have come from the same light; they all give the same basic messages. None have come to change the older revealed scriptures; they have come to remind people of the earlier Prophets’ messages which the people have forgotten. We have made our separate religions into walled forts, each claiming one of the Prophets as its own. But the Light of God cannot be confined within any manmade structures. It radiates throughout all of creation. How can we possess it? None of the Prophets belongs to just one caste, one creed, or one nation. Jesus is not confined to Christianity; Moses is not a Jew; the Prophet Mohammad is not a Muslim; Guru Nanak is not a Sikh. They have not come to establish institutionalized, sectarian religions. Those divisions are created by humans and reflect their own policies. By contrast, the Prophets come into the world with a message from God. They come to remind people of God’s teachings making them fresh and new again; they come to teach love, to encourage service to humanity, to remove ignorance by enlightening people with the knowledge of God. They come to change our consciousness; they come to show us how to live. Human beings do have spiritual wisdom deep within themselves; the One who creates the world is already sitting in their souls. But it is only when a Prophet of God comes down and starts speaking with Divine Wisdom that it awakens in people. The Prophet reminds them of the truth they know but have forgotten. Dharam is our universal term for God’s Divine Laws, which govern and empower everything from human behavior and worship to the movements of the universe. It is beyond dogma and sects. Sectarian religions have been made by humans, not by the Prophets. The truly spiritual person is above all these small paths. God is nearer, than your hands and feet, sitting in your heart, bringing more and more light inside you. God does not need any more praise from us; the whole universe is already praising God. God is so famous that He is concealing Himself. But even though we can add nothing to God’s greatness by our praise, we must ever remember God through love, faith and service. Dharam is not costly temples. It is not the light of a single Prophet; God’s Messengers continually come into the world to show people the way. It is not a particular concept of God, for nothing is outside of God. Dharam is not theory; it is practical application. Whenever dharam has spread in the world, it has given practical proof of its truth. The Prophets have not just described trees and flowers; they have produced them and shown their beauty to the people. People have very little faith in religion because today there is only talk. For spiritual teachers as well as devotees, putting the teachings into practice requires a life of meditation and love for the Creator. Each religion has two aspects: vision and history. Vision is spiritual. It is born of the inner light, of the Spirit. The all-pervading Light of God is seen through the inner light of gyan in a person, and the words born out of that Light are visionary revelations. Those words can only be understood when we meditate and search within ourselves for God’s Light, the source of that vision. Most of what we call religion today is simply management, not vision. It is based on selfish motives. Where there is selfishness, there is no dharam. It is our limited thinking that has created the forts and slogans of religions. If you approach the scriptures of all religions from a state of inner wisdom, you will find many similarities among them. What is the essence of religion? Truthfulness, love, faith in God, and service to everyone. We should transcend these sectarian barriers, think of each other as fellow human beings, and regard all Prophets as our Fathers. They all came to love us. Dharam is the greatest science. Hundreds and in some cases thousands of years ago, visionaries revealed to us what scientists are just now heralding as their latest discovery. The visionaries simply closed their eyes, sat comfortably in meditation, and described what they saw. They did not have to spend huge sums on research or waste battery cell power. We human beings have many powerful brain cells. Once they are developed through meditation we can observe the entire universe – from the microscopic to the vast expanse of the cosmos. Actually, scientists are only proving what has already been revealed. Our country’s ancient religious texts had already told us that some stars are so far away that it will take tens of millions of years for their rays to reach the earth. Five hundred years ago, while in meditation, Guru Nanak once said, “This sun you see is not the only sun—there are tens of millions of suns. This moon is not the only moon—there are tens of millions of such bodies.” When you see that celestial drama, you begin to think about this earthly drama in which we live. This is just a tiny speck in the vastness of the cosmos. Unfortunately, though the fields of the scientist and the saint are related, they never collaborate. The scientist feels, “I am so learned, why should I sit with an illiterate person?” For his part, the saint feels, “The scientist is an atheist. What have I to do with him?” Where there is dharam, oceans and oceans of knowledge have coalesced. It is our misfortune that we have not been able to explain dharam in a way that scientists could understand. The outward form of religion is bowing your head before God in a church, temple, or mosque. But until your mind and spirit bow in humility to God, spiritual progress is not possible. The physical body is only the house of our spirit. When our spirit is awakened, the confidence, faith, love and willingness to serve which will arise within us will be so powerful that we ourselves will be unable to understand the changes that come over us. Look to the One who gives birth to all religions. Don’t think that God is a theory; God is reality. If you think God is a theory, you will never become enlightened. And don’t think that you can ever be separated from God. As the Guru Granth Sahib (Sikh scripture) says, “God is sitting inside you, nearer than your hands and feet. The distance between you and God is as thin as a butterfly’s wing. We can never be separated from God—neither at birth nor at death.” Nor do our mistakes separate us from God. God is always forgiving. God does not say, “I want you to surrender before me.” God says, “I do not want you to be slaves. I have made you free.” But negative things are attracted to our mind and stick there, forming a curtain between us and God. If we simply think of surrendering our negative points, they will become slightly detached. As soon as one side is detached, the whole curtain falls away, revealing the light of gyan. Gyan is always inside us, hidden by the curtain of ignorant ego-centered thoughts. This curtain is not like stone. It is quite thin, has no weight, and can be broken very easily, just by a mere thought of surrendering. To be aware of the presence of God, you must clean your mind and be grateful to the One who is the only Giver, the only Doer. Think that everything in this world exists with God’s blessing, whether we regard it as pleasant or unpleasant. Only God knows what is good for us. If God’s love is in your mind, you will see that nothing in the world is without this Love. When you love God, you will start seeing Him among the animals, the trees, the inanimate things. God is present even in that which we cannot see. Only the one who is absorbed in God recognizes His presence. Such a person has given her mind to God, and thus attained God. There is so much love in God that all the rivers—the whole universe—can be filled with it. The moment you touch God, you become filled with love. That Light will not be found in any worldly religious show or building. That Light lives in our mind, in the mind filled with love. Wherever we are sitting—in the forests, fields, or mountains—God gives light to the loving mind. God is waiting at the gate, but no one is standing in line. All the gates are empty. No one is waiting to enter. So let us pass through that gate where love dwells, and only love. Meditation is a magnificent power. With meditation, you gain the desire to serve and the ability to achieve your spiritual and worldly goals; you develop compassion, fearlessness, divine wisdom, renunciation, love, and freedom from the cycle of births and deaths. Meditation allows us to meet with the King of our spirit. To meditate is to become deeply silent, to keep listening, listening, listening to God. To listen is to become lost in God, perceiving Him in all of creation. Then one is merged with the Great Reality. No worldly pleasure can compare with the sweetness of this communion. The only method of meditation that works is to offer God constant love. At first, continually focus all your scattered attention on whatever form of God you worship—your Isht, such as Lord Jesus, Lord Krishna, Lord Siva, Durga Mata, or the Gurus. And because it is the nature of the mind to wander, we can concentrate on God by repeating God’s Name. The energy which has been scattered among all our weaknesses will become focused on the positive; negative thoughts will disappear and truth will be revealed in our mind. Early in the morning, when you first arise, thank God and do a little bit of meditation. Go deep inside, concentrating all your awareness on God. Then the whole day your mind will be focused on God; nothing will bother you. The more you love God and practice meditation, your weaknesses and bad habits will be driven out, and love and truth will be revealed, as if dust were being cleaned from a mirror. In deep meditation, your awareness of yourself ceases. You are unaware of the passing time, and you do not become tired. Your breathing becomes fainter. People may be beating drums or shouting around you, but you will not hear anything. Your soul rises above your body; it maintains just enough connection to keep you alive. Over time, very gradually, the inner light, divine wisdom, vision, and truth will awaken in you. Your Isht will enter your heart and start loving and talking to you. As the Sikh Gurus say, “sometimes you laugh, sometimes you cry, and sometimes you become silent, but you care for no one except God.” You will become detached from worldly things, for you are always connected with the Truth. You will not care if people are looking at you or laughing at you for you are looking only at God, absorbed in the bliss of God’s Love. Then you will not need to sit in meditation with your eyes closed in order to be aware of God. You will be joined with God at all times. Whether you are walking, eating, or talking to someone. You will truly feel, “Tohi mohi, mohi Tohi” (You are me, and I am You). You will remain in the world, doing your worldly duties, and you will be always happy. Why is there no spiritual attainment in religion today? We perform our own kind of rituals, but we do not worship with love. Instead, we look at our watches and see that we have spent five or ten minutes. We do not concentrate on worship. Perhaps we have placed flowers, bathed the statue with milk, lit some incense, bowed our head, and our mind is satisfied. But this satisfaction is false. These actions are all right, but they will not change our fate. When we stand before our worldly father, we bow and ask, “Father, what are your orders?” He gives us some work, and we are to do that. When we go to a religious place, our Heavenly Father also gives us orders. He says, “My child, always tell the truth. Do not steal. It is wrong to criticize others. Do not deprive others of their rights. Do unto others as you would have them do unto you. Do not covet what is your neighbor’s.” We may have gone to our Heavenly Father every day, offered flowers to Him, bathed a statue with milk, worshipped Him for ten minutes, but we have not obeyed a single commandment. It is amazing: We sit before Him every day but we still only do what comes to our own mind. We do not even come close to following what He says. We should be keenly aware that a place of worship is a school for the mind, a school for cleansing the impurities from our mind. But how do we behave in this school? We take the first primer in our hands but we do not read it. We bow our head and make some demands, but we do not obey the commandments. This means that we have been holding the same primer for many years, but we have never even once read it. How can we advance to the second book? The second book will only be given to us after we have obeyed the commandments in the first book. In worldly terms, after a person studies, eventually he attains something. After twenty-five or thirty-five years, he passes his subjects and completes the course, and there after receives some employment. Why is there no such attainment in religion? Because we truly think that a religious school is only a place to bow our heads, and that by bowing we can achieve everything. But let me stress that there is no school anywhere in which we can attain anything by just bowing our heads. One can achieve something only through action. Look at history: With whom was God pleased? To whom did God speak? To those who deeply loved God with open hearts. They saw God in the trees, in the land, in the skies. God spoke to them. When we go to religious places, we offer cash to the religious authorities who say, “We will pray to God for you.” But I don’t think He wants our money. God is not poor. God is not a beggar. God is so powerful that He is distributing wealth to the whole Creation. He gives us breath, energy, clothing, employment, the very bed on which we sleep. He is such a great Giver that His bounty has no limits. When a priest expects something from people and begs, it is a great insult to God, for he turns God into a beggar in the public’s eyes. When we are full of love, then we worship from our heart. When the saint Nam Dev was a boy, his father instructed him to offer milk daily to the statue in their home while he was away. Innocent Nam Dev did not know that his father always drank the milk himself after offering it to the statue. So when Nam Dev offered the milk and the statue did not take it, he begged, “Please drink this offering, my Lord.” The statue still did not drink the milk. Nam Dev persisted, “Do you want us to have a fight in our family? If you do not drink this milk, my father will be very angry with me.” He kept pleading with the statue. Finally, the hand reached out from the statue and drank all the milk. The father had been performing this ritual for years but had attained nothing. But when Nam Dev approached the statue innocently, in love, the Lord started drinking milk and speaking to him from the statue, because God is in every place. It is good to worship. But worship from the heart. If we stand before an image of a manifestation of God, we should use it to focus our scattered mind, to concentrate our attention on God. Eventually, the image will begin to move, to speak. Then that One will begin sitting inside us. When it lives within us, it becomes Light, and nothing else is left except Light. Then we will talk to the trees and the animals. God will speak to us from within our own mind, because it has become pure. The real temple of God is a pure mind. Meditation is essential to develop will power. When your thoughts are under control, you become free. When your mind is clear, you can conquer the whole world. As the Prophet Mohammad says, “Do jihad”—struggle for good. The greatest jihad, he says, is to control the raving mind. Guru Nanak likewise said to struggle against your weaknesses — by rising in the early morning ambrosial hours to meditate and by working hard all day or night. Your mind is like a horse. If your horse is strong, it will outdistance all the other horses. If it is weak, no matter how much you urge it on, it fails. If it is untamed, it may throw you. Today, all the horses are out of control. Like a horse who keeps throwing its rider, our thoughts are shaking us from within. “What is going to happen now? Things are not going according to my plans.” Everyone’s mind is out of control, so accidents happen—we hurt each other’s feelings, take away other’s rights, and attack others. All the horses are wild and untamed. No rider is able to hold onto the reins. How can you rein in your wild horse? Control your desires. You need not even use your own strength. Rather, start loving God and meditating. It is best if the reins are in God’s hands. Know that whatever God does is right. In addition, always try to live close to nature, for you will be very near to God. Worry, fear, and pressure will be far from you. Your mind will be open, free, and clear, with no enmity. Your mind will be fearless, kind, and full of love. The muscles of your mind—as well as of your body—will be strong. A person with a strong mind is not susceptible to evil; it cannot enter his thoughts. His mind goes straight ahead. And one day his inner truth mixes with the Great Truth. We say, “Oh God, everything is yours.” But we are only speaking with our tongue, not with our heart. God knows our inner self. When we truly offer everything to God, He gives us everything to use, though not to own. To feel that someone Else is the owner of these things frees us. Guru Arjan Dev says, “Whosoever has God as his friend never wants for anything.” He has all happiness, he has all joy, because his dealings are with God. Whatever he says will be fulfilled by his Father. We need not worry. The only thing we should worry about is whether we have hurt anyone’s feelings or deprived anyone of their rights. It is God’s job to take care of us, just as God takes care of all creatures. God has given us a mind that is so tender, so full of love and truth. But we harden it by worrying. From morning to evening, we worry about what will happen next. Our anxiety actually creates accidents. Instead, hold fast to truth, love, and joy by loving God. We should at last admit that nothing happens without God’s orders. We should unite with the One who gives the orders. We should pray, “Dear God, please give us that faith which cleans our mind of all doubts, leaving only love.” Once you receive God’s love, you will be filled with so much love for Him that whatever you ask of God, He will provide. Even if you do good deeds and follow a spiritual discipline, you still may experience difficulties in the world. But do not lose faith, for through these difficulties, the actions of your past lives are being cleared away. People assume that everything should go according to their own desires. That cannot be. Our lives are shaped by our past deeds and thoughts, from hundreds of thousands of previous lives. Our karmas from all these lives form a crust of filth on our mind. If we want to change our fortune we must burn our karmas with the fire of meditation. Sometimes so much rubbish has accumulated that even if we set it on fire it will keep burning for days. With such heaps of rubbish, it is unrealistic to think that we will achieve something simply by performing some special worship for ten days or forty days. Trying to bargain with God like this is of no value. Whether we worship God or not does not add to or detract from His greatness. The whole of Creation is already worshipping Him. Where we crave results there are desires. And where there are desires, there is no true love of God. Think, “Whatever I have done, I have received my due.” Do not blame others for what happens to you. It is the person who has cleared all his karmas who knows God as the One who fulfills all desires and gives all happiness—Icha purakh, Sarab Sukh Data. There is no difference between him and God, between his thought and the thought of God. In order to be made into precious jewelry, gold must first be melted in the furnace. A washer-man whacks and whacks clothes to clean them. It is not that God treats us unkindly; we are drubbed to cleanse our filth and to purify our mind. The filth will only leave us through constant pounding. pounding, pounding. Many infants were killed by the king when Jesus was born. The king had learned that a great power had been born and he hoped to end that threat to his supremacy by ordering all the babies in the area killed. Many babies were killed, but Jesus’s parents took him away safely. As soon as the king passed that order, God ordered that the new Sun should rise quickly, and the king’s light was covered with darkness. God embraced Jesus and kissed him, and said, “My son, whatever I say to you will remain forever on the earth.” The infants who died for the sake of Jesus were all reborn into great houses; they enjoyed worldly blessings and they themselves became great. People who are killed for the sake of a Prophet of God are always reborn into very good lives, they are especially blessed by God. God is very watchful when His Prophets come to the world. It is a period of great blessings. The soul never dies. But when we look at it from our limited human standpoint, we think, “He was an old man; it was his time to go. But why did the young person have to die?” There is a great secret behind this. Though a person may appear to be a child to us, if we were able to look within them, we would see that his soul is not that of a child. He has already taken many births. He has left the world and returned many times. Dharam continually teaches us that there is no such thing as death, even though all things leave the world. So why is it so difficult for us to accept? Human nature is very loving. We humans never forget anything which leaves us. Even if the cup breaks from which we drank our tea everyday, we will remember it for many days. Why? Because we loved that cup. When the family dog dies, we don’t eat for days. When our love for another person is so much greater, it is naturally very difficult to forget them. It is especially difficult to accept the death of a person whose heart was filled with kindness and love, who always thought about others, and was always concerned that others should not suffer. But people cannot fully understand God’s rules. We say, “we want to see that form, we want to hear that voice.” But the one we love is going to take birth again. Their innocence, their power, their karma will be reborn. We should never forget that all the Prophets called this world mirt lok—”the transient world”—for nothing here remains. The body will definitely leave some day. Lord Krishna said, “What is death? You simply exchange your old clothes for new ones. There is no death for us.” But the nature of life, death, and karma is a subject for the Prophets. The average person has difficulty understanding it. No doubt, we are filled with sorrow when a loved one dies. But we should not be annoyed with God or ask “Why did this happen?”, because the person was carrying his karma from previous lives. Remember also that even while people are crying here, somewhere else people are offering congratulations as he is reborn. They are rejoicing, “A good child has come to our house at last.” He has gone on to be born in a home where he was greatly needed. And although his body has gone from this life, his thoughts will never leave. If they were good thoughts, people will continue to benefit from them. We should therefore pray that God will send our loved one to a good place, where he can continue his good work and continue to develop his or her thoughts. Dharam teaches us that progress does not occur in just one lifetime. For example, a person does not become a good doctor in one lifetime. She has studied the body many times, and after many births, she becomes familiar with each part of the body. A scientist has been pursuing his research for many lifetimes. At one point, he realizes the essence of his research and develops something. Some children at the age of three or five start creating buildings or taking photographs, because these are the things they were doing in their past lives. The child picks up from where he left off. We have been here many times before and left many times, but we do not know it. It is a secret that God has kept hidden from us. Wherever God is remembered night and day, such a blessed atmosphere will be created that healing occurs automatically. However, the greatest healing comes from looking to see what lies within ourselves. We all have a wonderful power within us. Whether we are poor or rich, sinner or saint, we all have Light within us. The greatest truth that comes from going deep inside our self is that we recognize that Power which lies within us as Light. When we are in love with God, kindness and love and the desire to serve others will develop within us. When our mind is healed, our thoughts will become very pure and holy, and our body will also be very happy. By contrast, fear, hatred, anger, and egotism have very negative effects on the body. This is our greatest ailment—that we have fear, hatred, ego, and anger within us. Whenever we are under the influence of anger, every part of our body trembles. When we are afraid, fear weakens our mind and also our body. The disease of nervousness, of worry, afflicts ninety percent of people. If this affliction is eradicated from the mind, all physical diseases will also end. We may try to heal our body with the help of herbs, or allopathic medicine, or homeopathy. But who will heal our thoughts? The body may of course be healed and the ailment eliminated. But it is our thoughts that irritate us. Throughout the world, people are trying to find comfort by every means possible, be it yoga or medicine or acquiring big cars and big houses. Despite all this, people are not happy. We should instead transform our mind, our thoughts. When we heal our mind, disease will have little chance to enter our body, and negative thoughts will not have the opportunity to pollute our mind. Humans are the most poisonous of all creatures. When we become angry and commit a crime, a wave of poison spreads through the atmosphere. If we purify our thoughts, if we make them loving, serving, and compassionate, I think the environment of the whole world will be cleansed. When our thoughts are poisoning us, how will worldly medicine help us? If we could achieve pleasure through medicine, then those rulers with very learned doctors would be supremely happy. But both the rulers and the doctors are unhappy. The medicine for our thoughts is not worldly medicine. We can get it only from meditation. When we turn within and meet God, we will all be healed. God will heal our inner sickness and our outer sickness as well. Guru Nanak introduced a new path to spiritual attainment. He said, “Let me show you the direct path to God: “Work hard to support yourself by honest means, always remember God, and share the fruits of your labors for the uplift of humanity.” Nam (reciting God’s Holy Name) without seva (voluntary work in service to God’s Creation) is not acceptable to Guru Nanak: “If people retreat to the mountains to recite Nam, who will put out the fires of the burning world?” Every person has to work and help others, for this is God’s hukam (divine command). One who simply sits idle and meditates will not find favor in God’s court, and because he is not helping people, he will not find favor in the world either. God is the greatest Worker. He is always busy caring for everything – the trees, the people, the earth. If God is constantly working in the world, then how can those who say they believe in God sit idle? Those who become part of our (Babaji’s) mission tend to work four times harder than anyone else. The power that comes from their love of God not only brings out that work ethic but also the strength to follow it. Work with your hands and feet and keep your mind joined with God. Work is a form of meditation if your mind is in a state of love. If your mind is attuned with dedication, you are with the Creator as you are serving. If your mind is far away – if you are thinking of your family or friends for instance – then you are not able to do the dedicated work you are supposed to do. When you combine work and worship, you can work harder and serve more. God works so hard and is always happy. If we love God, we will be happy while we are serving and we will always remain with Him. Everyone has goals, but most people have the wrong goals, such as sleeping, drinking, and producing children. People with these goals are not much different from animals. Human goals should be beneficial, such as doing seva and helping society. How can we develop the motivation to serve? By meditating. And how can we develop the desire to meditate? By starting to meditate and depending on God. I have no personal mission. I simply work to put forth God’s message that has already been given to others: We are to serve the poor and work to uplift humanity. I have full faith that if people of all religions come together and work in service to humanity, the whole world can come together in harmony. But we must set aside our self-interest and work in selfless service to others. We must be so strict in our program that God will always take care of us, just as a father runs to help his child at all times. The basic goal of all religions is to take those things that are not in productive use—be they land, trees, or the human mind—and help them develop. As part of God’s commitment to the Prophets, God has always commanded them, “Go and prosper, and make these minds and lands productive.” Adam planted wheat; Noah planted grapes; Guru Nanak cultivated the soil with his own hands. God commanded them to make the land productive. This commandment from God continues today. Food is needed for people’s bodies, just as Nam is needed as food for the mind. Guru Granth Sahib says, “The one whose Friend is God can never be separated from God. He will never come nor go from the presence of the Indestructible One.” God is always present with us, nearer than our hands and feet. Why should we abandon such a House where caste and lineage do not matter, where there is no high or low? God always receives everyone, saying, “Welcome! Come!” He is always forgiving, always merciful. As Guru Gobind Singh says, “He does not point out our drawbacks.” Guru Nanak says, “You are my Mother, You are my Father, You are my dearest Friend.” Make God your Friend and then see what He will do: He will throw open the gates of blessings. Peace of mind is not dependent on one’s surroundings. When you love someone their presence fills your thoughts at all times. When you love God – then God is with you at all times and the peace you receive is indescribable. There is no greater peace than that which results from this love. Once Guru Gobind Singh, in a very loving mood said, “Listen very carefully: Only those who truly love God can ever find Him.” This is the essential inner secret. From time immemorial, whenever the world is really burning, really suffering with sins and oppression, God has sent his Messengers to educate people in dharam. He has empowered a few good people with His Spirit, and through them has changed the whole world. God never becomes angry. When the world is suffering, He takes a few people and begins to build love in the world again. The world has become so polluted; our minds have also become polluted. But when God’s Love comes, it will be such a great wave that all the filth and corruption of the world will be swept away. God’s Love is so powerful that nothing will remain in its way. Do not bewail the state of society. Change the state of your mind by sowing the seed of Nam. Do not waste a moment. As soon as you start meditating, reciting Nam, and seeking God’s Light within yourself, your life will change. As more and more people do so, the world will change. God’s Power has never left the world. From today, we should all follow God’s teachings and anticipate that day when God transforms the world, and the Truth, which is now hidden, comes out and starts working among the people again. That day is upon us.